Now, there won’t and can’t be any current-events test of MMT until we get out of the slump, because standard IS-LM and MMT are indistinguishable when you’re in a liquidity trap. But as Mike Konczal points out, we are in effect getting a test of the market monetarist view right now, with the Fed having adopted more expansionary policies even as fiscal policy tightens. And the results aren’t looking good for the monetarists: despite the Fed’s fairly dramatic changes in both policy and policy announcements, austerity seems to be taking its toll. I would add that the UK experience provides a similar lesson. Mervyn King advocated fiscal consolidation – I’d say that he shares equal responsibility with Cameron/Osborne for Britain’s wrong turn — but more or less promised (pdf) that he would and could offset any adverse effects on growth with monetary policy. He didn’t and couldn’t. The last words in the quote above should be “He could but didn´t”. From my last post it´s clear that the Fed´s changes in both policy and policy announcements have not been dramatic enough. 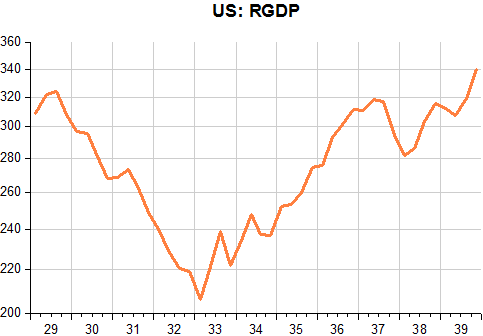 I am not trying to use Krugman´s usual argument that back in 2009 fiscal policy didn´t work because it was ‘not expansionary enough’. Exactly what the Fed hasn’t been willing to do is something nearly as dramatic as what Roosevelt did. They have not been wanted to change their goals or operating procedures in a way that might seriously rock the boat of public expectations. So, what they have been doing is pushing the boundaries of their current regime, not changing the regime. From the perspective of today’s discussion, what is most important about adopting a nominal GDP target is that it would be a pretty clear regime shift—a very different way of conducting and talking about monetary policy. And, so like Roosevelt’s actions, it might have more impact on expectations than the incremental changes the Fed has been following so far. And what did FDR get? 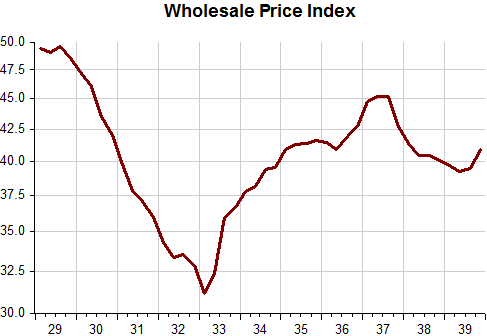 The charts illustrate. See how things dramatically change after March 1933. And how things go into reverse following the monetary contraction in early 1937, when required reserves were raised and the Treasury began to sterilize gold inflows. The place where we might be seeing a country try to follow the Depression lesson is actually Japan. Japan went through what the United States experienced in 2008 almost 20 years earlier. Back in the 1980s, their economy was the envy of the world. But they had a bubble and bust in their housing market that wreaked havoc on their financial system and caused a prolonged downturn. 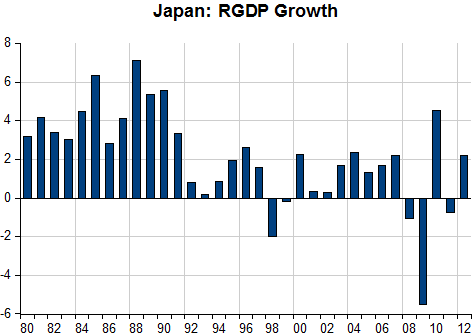 Japan hit the zero lower bound on interest rates in the late 1990s, and just sort of got stuck in a trap of low growth and steady price declines. 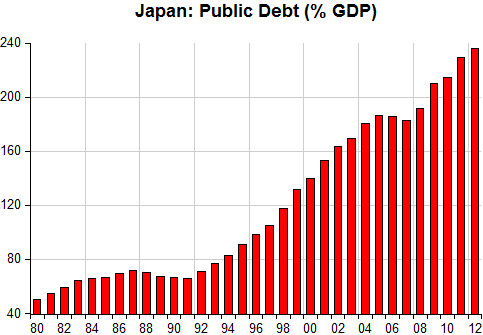 Unlike almost every other advanced country in the world, Japan has had deflation for almost 15 years. But, like our Federal Reserve, the Bank of Japan has not wanted to take dramatic action. But no one, not even Krugman, can say they were ‘timid’ with fiscal stimulus. The charts illustrate. 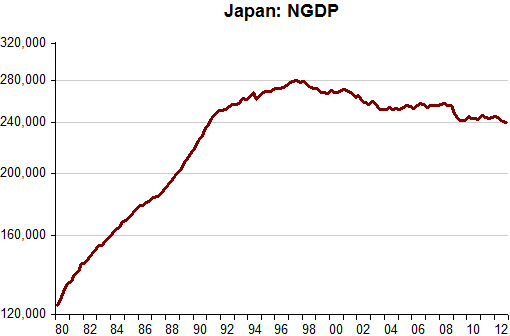 And the reason is, as argued by Christy Romer, not only that the Bank of Japan has not wanted to take dramatic action but that it has adopted increasingly tight monetary policy as shown by Japan´s NGDP history! And that´s the reason fiscal stimulus has not been helpful at all! I’m not claiming that there is nothing the central bank can do; but as I’ve tried to explain before, monetary policy can, for the most part, gain traction under current circumstances only by changing expectations about future actions (and changing them a lot). Meanwhile, fiscal policy has a direct, current effect on the economy, which easily trumps attempts to move the economy by changing the Fed’s messaging. 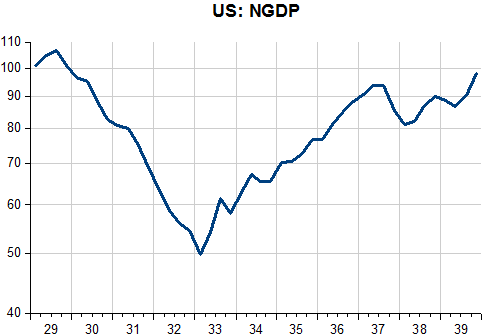 Sorry, guys, but as a practical matter the Fed – while it should be doing more – can’t make up for contractionary fiscal policy in the face of a depressed economy. One of the most powerful obstacles to world recovery is the increasing intensity of Government interference and trade restrictions, is the opinion of Professor Lionel Robbins, of the London School of Economics. According to Professor Robbins, a return of business confidence is essential to recovery but an antecedent to this is some measure of monetary stabilization, with the ultimate aim of a restoration of the gold standard. That, however, would be a gradual process to be achieved only when new exchange parities had been definitely established and international trade and investment had once more become active. This will necessitate, of course, a removal of the existing trade restrictions. The gold standard, however, must be one functioning with the untrammeled use of the bank rate and unrestricted gold movements, and not on the present “managed currency” basis. Here is the internal contradiction – the Sumner critique, if you will – implicit in the Keynesian fiscal-policy prescription. Can fiscal policy work without increasing the rate of inflation or inflation expectations? If monetary policy alone cannot work, because it cannot break through the inflation targeting regime that traps us at the 2 percent inflation ceiling, how is fiscal policy supposed to work its way around the 2% inflation ceiling, except by absolving monetary policy of the obligation to keep inflation at or below the ceiling? But if we can allow the ceiling to be pierced by fiscal policy, why can’t we allow it to be pierced by monetary policy? Perhaps K&K can explain that one to us. Professor, as a matter of fact, while in denial, PK just tries to put in pratice the kind of approach that people like Samuelson and others falsely used to atribute to Friedman: always taking the better in a discussion even when wrong. He is definetely as dishonest as it gets. You know, if I got 50 cents for each chart that is ‘pinched’, I could actually make some money out of blogging! But I´m happy that people do that often because it means they´re useful. Lol, I dont use other peoples graphs, I link to posts usually (unless I really want to show something when I dont have access to data ;). troopa, you´re free to ‘use and abuse’ them! I knew ‘troopa’ was you! I call out whatever name you use. I keep saying Japan, Japan, Japan, and this excellent post again highlights that my obsession has some reason to it. 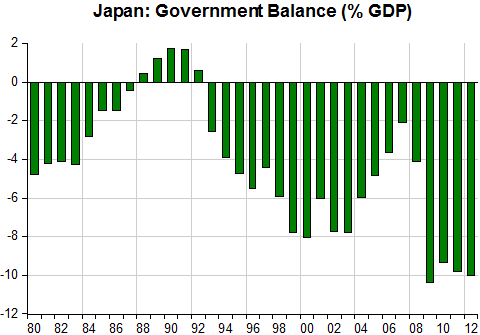 Since 1992, Japan has spent itself silly on federal deficits, but the BoJ asphyxiated the nation. Better, they ran balanced budgets, and the BoJ flooded the country with money, which would have revived real estate and lessened debt burdens. Poor Japan! From world leader to also-ran at best, while an entire generation of young people have learned not to think about careers or economic progress. The USA? Are we headed on the same path?